One of the first things I always do when we take over content development for a new client is to perform a quick content audit on their current blog. I do this for one main reason: It almost always highlights a few low-hanging fruit (blog posts) that can be optimized to immediately start ranking better in search results and drive more traffic. In fact, this works so often that it kind of shocks me that companies don’t immediately turn to old blog posts to help drive more traffic. It seems like once a blog post is published, tweeted and “liked” on Facebook, it’s forgotten – forever to be buried in the archives and never heard from again. This is such an enormous waste of an investment that it makes me want to pull my hair out and violently shake our clients. You pay money for your content – even if it’s created by internal staff, it still takes time and expertise. So make use of your old blogs. Don’t waste that investment! The next time you find yourself with a spare half hour to work on your company blog, go through this quick process to get more traction out of your old posts. Sort through your analytics to find the top 10 or 20 most popular blog posts on your website. Organize them (I like to use a spreadsheet like this one) in a list with headings for the blog title, permalink, blog topic, and keywords targeted. Start with the first blog post and ask yourself this question: If I had to sum up this blog topic in 3 to 4 words, what would it be? Use that as a starting point for your keyword research. For instance, this blog post is about “optimizing old blog posts.” On your spreadsheet under the “blog topic” column, type the corresponding word or phase. Now, once you’ve got a concise blog topic pinpointed, it’s time to figure out what people searching on Google are typing in when they’re looking for the content that your blog post contains. Pull up Google’s Keyword Tool in your browser, pop in your blog topic description (those 3-4 words that described your post), and Google will generate your results. For instance, when I looked up “optimizing old blog posts,” guess what I found? The number of monthly searches is so negligible, Google doesn’t report it. That means that if I use that keyword phrase in my content and my title, it’s not going to do me any good, because no one is searching for it. There are two main numbers I look at for quick content optimization: Competition (Low/Medium/High) and Global Monthly Searches (even if your business is local, driving overall traffic is still good). I like to sort Google Keyword results by Competition, and then look for keywords that have low or medium competition and searches of at least 1K so that it will be easy to rank quickly for them. Browse through the keywords on the left to look for phrases that match your blog topic well. While I was looking through my results, I noticed that “content optimization” and “seo for your blog” both summed up my post pretty well; they both have low search competition; and they each get 1,900 searches a month. Quick Tip: To make sure you’ve chosen good keywords, pull up an incognito window in your browser and search for those keyword phrases. This will make sure that the phrases that you’re about to optimize for are garnering the types of visitors that you want. For example, imagine you’re a baker and you wrote a blog post about baking delicious pies and you see that there’s 5,000 searches a month for the phrases “making pies” that has little search competition. On the surface, that seems great. But maybe there’s a new pop artist in town and he just released a Top 40 hit named “Making Pies.” If you optimize your blog post for that phrase, you’re going to get a lot of angry pop music lovers visiting your blog who wanted to listed to music, not learn about pies. 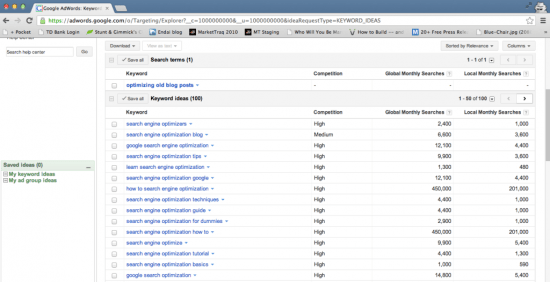 This is the part where we take our newer, better, more search-friendly keyword and put it into our blog post. Now, updating your actual blog content with optimized keywords is ideal (so long as you don’t stuff keywords and keep your content readable), but this post is all about quick optimization techniques, so we’re going to ignore the body content of your blog. 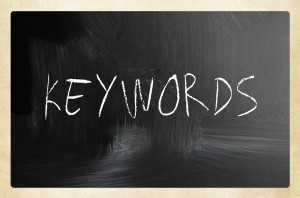 What we are going to focus on are the: Title, Permalink, and Keyword Tags. First things first, take the 1-2 updated keywords from your earlier research and update your keyword tags in your blog post. If there are a bunch of other keywords listed, get rid of those. As a rule of thumb, I never have more than three keywords for each blog – you want to keep it simple so that Google understands what your post is about. Adding your keyword into your blog title will help Google realize that your blog post is about optimizing content, and if it sees this phrase in your title, keyword tags, and body content, it’ll be able to easily pinpoint that phrase and rank your post for it. 7. Create a custom permalink. What’s a permalink? A permalink is the specific URL for a designated blog post. If you don’t specify a custom permalink, you’ll get a very generic looking one that’s generated by WordPress or Blogger that looks something like this: http://stuntandgimmicks.com/blog/ps325. An un-optimized permalink doesn’t give search crawlers any info on what your blog post is about. A custom permalink, however, tells them exactly what your post is about and what keyword or phrase it should rank for. Finally, when you’re changing your permalink, remember to create a 301 redirect from the old URL to the new URL in order to make sure that earlier links that may have been sent out via social media or other sharing sites don’t end up going to a blank page. And there you go – seven easy steps to optimize old content on the fly. Do YOU have any quick and dirty optimization tips that you want to share? Lauren Fairbanks is Partner and Co-founder of Stunt & Gimmick’s, an NYC-based content marketing and lead generation firm. Before she started her own firm, she worked in publishing at AOL and founded a popular lifestyle website that she sold in 2011. She’s been featured in Cosmopolitan Magazine, Forbes, Crain’s New York, CNN, AOL, and the New York Enterprise Report.